Hi everyone! My newest box set is now available, and it’s all about bear shifters. This collection of five stories includes Poking the Werebear, The Spectacled Werebear, Kissed by a Koala Bear Shifter, Honey Werebear, and The Pandaman. While working on a bamboo farm, Riley is certain she’s seen a giant panda roaming the grounds for late night snacks. But panda’s aren’t native to the Pacific Northwest, and no one’s believing Riley without proof. When she sets out to prove the panda’s existence, she discover’s a truth that’s even more unbelievable. Werebears do exist, and they come in all shapes and sizes. Just how far will the odd bear shifter go to maintain his secrecy? When one monster just isn’t enough. All the gangs in one mega-bundle! Eleven stories brings over 40,000 words of hot banging goodness together in one boxed set. There’s an awful lot of action going on from aliens, goblins, orcs, gremlins, centaurs and werewolves! Whether it’s one at a time or all at once, these mythical creatures aren’t going to stop until she’s begging for more. The stories in this bundle are from Mina Shay’s Alien or Mounted by a Monster lines and includes: Goblins, Gang Probed, Werewolf Pack, Bride of the Orc Tribe, Goblin Scavengers, All the Aliens, Gremlins on a Plane, The Forest Goblin Gang, Alien Train, The Centaur Herd, and Goblins At the Tower. Hi everyone! The latest boxed set is now available. It contains these five stories: Bride of the Orc Tribe, Mystic In My Mind, Black Eyed Being, Hammered by a Hydra, and Honey Werebear. There are two things that Jackie doesn’t do very well: breaking up with ex’s and following rules. Her latest break-up has landed her in a secluded, ultra-luxurious private getaway on a Greek island. And of course, she can’t even follow the one simple rule once she gets there. Jackie never expected those two items would ever bring her face-to-faces with a mythological Hydra. 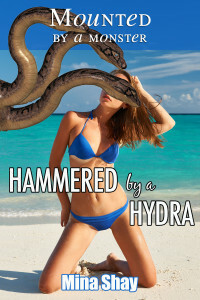 What will she do when the Hydra discovers her? When the Black Eyed Being came knocking on her door, she should have turned the stranger away. But nothing exciting ever happened in the suburb, and the woman wasn’t even sure if he was real. Will she have the presence of mind to turn him away when she learns the true nature of the stranger and his desires? Charlene is determined to do anything to win this years blue ribbon in the Honey festival. Even if that means breaking and entering into Caleb Johnson’s barn to swap out the wrong jar of honey entered into the contest. Charlene finds herself in a sticky situation when the bear of a man catches her in the act. What will she do when he displays much more than his usual grumpy self? Charlene is trapped inside his barn, with nothing between her and escape except for one grumpy werebear and a jar full of honey. I write erotica with a paranormal bent, mostly involving monsters and aliens. You can reach me via email at minashaywrites@gmail.com.